Steering angles are very good. Fly jib. Top section is plastic. The hook block has to be reeved for single fall operation which is not so realistic. 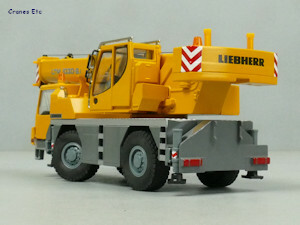 The real Liebherr LTM 1030 was first launched back in 1997 and it has been continuously improved since then. This model is an updated version of the previous model numbered 2105. 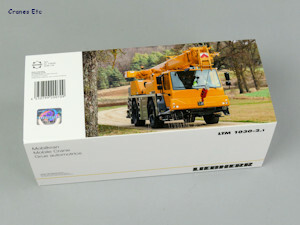 The model comes in a new-style Liebherr branded box sleeve which encloses expanded polystyrene trays. 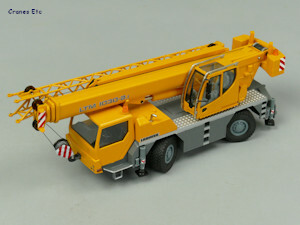 There is no information about the model or the real crane. 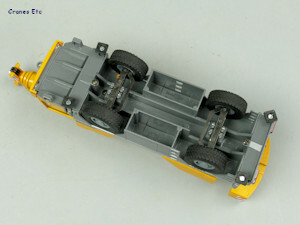 The underside of the carrier is very simple by modern standards, with functionally modelled steering. The wheels look good with nice tyres. 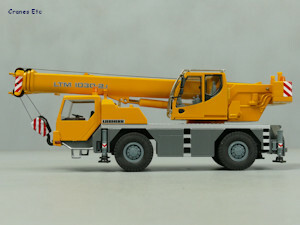 The carrier cab reflects the latest iteration of the real crane, but it is simply detailed and there are no door handles, windscreen wipers or mirrors. 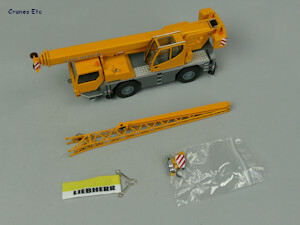 A tie-on point for the hook is included, and the cab interior detail is reasonable. The rest of the carrier is also simple and reflects the model's heritage. There is nice diamond plating on the deck, the rear lights are painted and the outrigger beams are tough plastic with the pistons having visible screw threads. The outrigger beams are tough plastic. 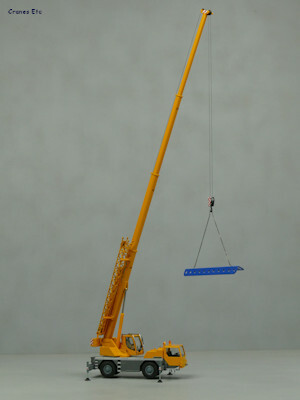 The crane cab has the modern shape and there are metal grab rails and a plastic mirror assembly. The main boom ram has a plastic jacket and a bit too much piston is visible when the boom is stowed for transport. The boom has simple detail and there are metal sheaves in the boom head. 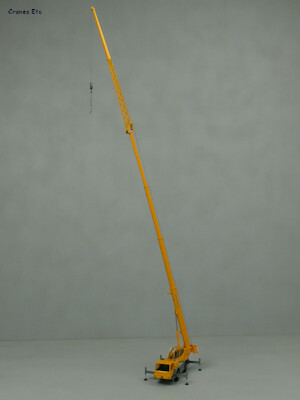 The bi-fold swingaway jib is a very nice metal lattice casting with a painted plastic solid section. 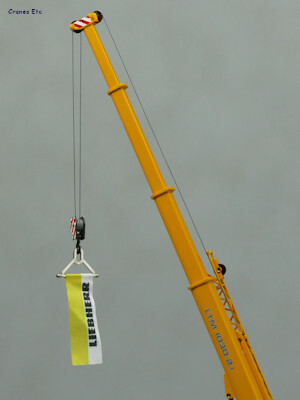 All sheaves are metal although the boom head ha a reduced number compared to the real crane. The hook block has three sheaves but they are an old-fashioned solid plastic block. The model really needs a single line hook for the fly jib even if it was a replacement for the supplied block. Both axles steer and the range of movement is very good. The rear axle has minor oscillation. The outrigger beams are single stage and they extend with pistons that screw down revealing visible screw threads. 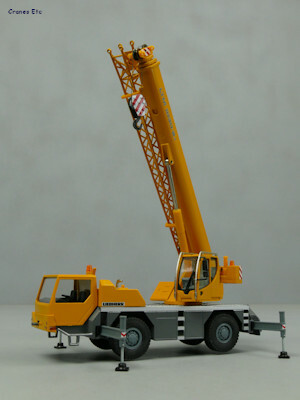 The outriggers are strong enough to support the crane off its wheels. The counterweight looks like it has a removable piece but in reality it is firmly attached. The boom is raised with friction within the ram holding most moderate poses. The telescopic sections extend smoothly and lock into place when full extension is reached. The winch drum can only be turned by finger on the drum, and the brake is by means of friction rather than a positive lock. There is limited rope on the winch drum. The fly jib can be pinned at half or full length. It is a robust model . The paintwork is very good as are the few graphics. It is a decent value. This model has been around for a long time since its introduction. 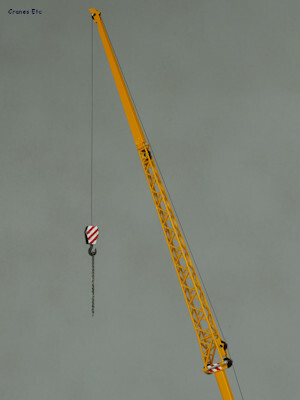 It is good to see it updated to reflect the real crane. 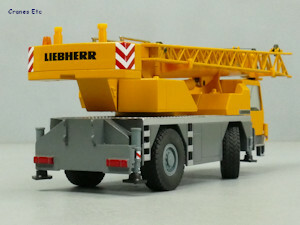 But it is a pity Liebherr did not require a little more to bring the model up to modern standards with some additional detailing and graphics and a changed hook. The first version of the model was numbered 2088. In 2010 the model was replaced by a new version with model number 2105. Parts out of the box. 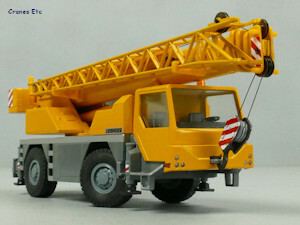 Model can be posed wheels-free.